To prepare the rice pudding: add the milk to a medium-sized pot with the cinnamon and a pinch of salt. Boil and add the washed rice. Cook at low heat for about 1 hour or until the rice is soft and tender. Stir from time to time. Remove the cinnamon from the rice. Add the sugar. Cook for 20 minutes or until soft and creamy. Stir frequently to prevent sticking or burning. Add the butter, condensed milk and vanilla, and then stir well. Remove from the heat. Cool in the refrigerator. Melt the butter in a pan over medium-high heat. Add the apples, sugar and cinnamon. Cook until tender (stir occasionally) and the sugar becomes syrup, about 15 minutes. Cover the apples until you’re ready to serve. Divide the rice pudding into the cups. Add half of the apples, half of the cereal and then cover with the rest of the apples. Repeat the layers with the rest of the ingredients. Finish with cereal and serve. This recipe can be prepared a day in advance and kept refrigerated until you're ready to serve. You can also add raisins if you like. Arroz con leche is one of those Latin recipes that will be passed on from generation to generation. 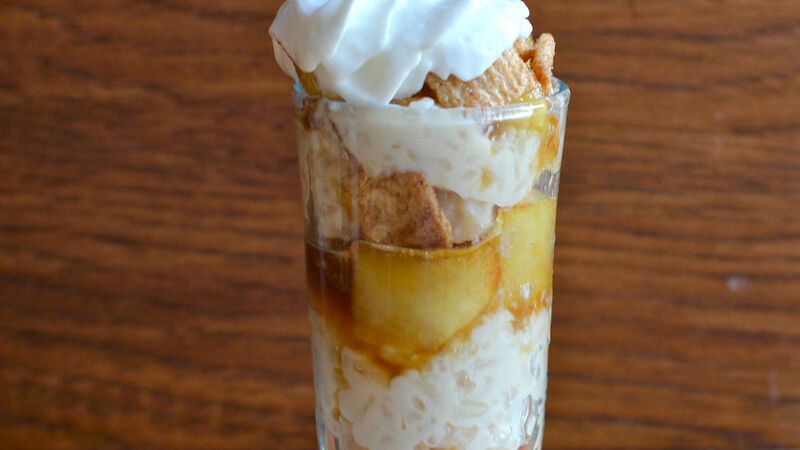 Today I will prepare a delicious rice pudding parfait with caramelized apples and Cinnamon Toast Crunch™ cereal. This dessert is perfect for Thanksgiving if you want to give your celebration a Latin touch. You can even prepare it for Christmas!